Alaska Gateway School District is excited to bring a two-week Where Are Your Keyslanguage workshop to the district! 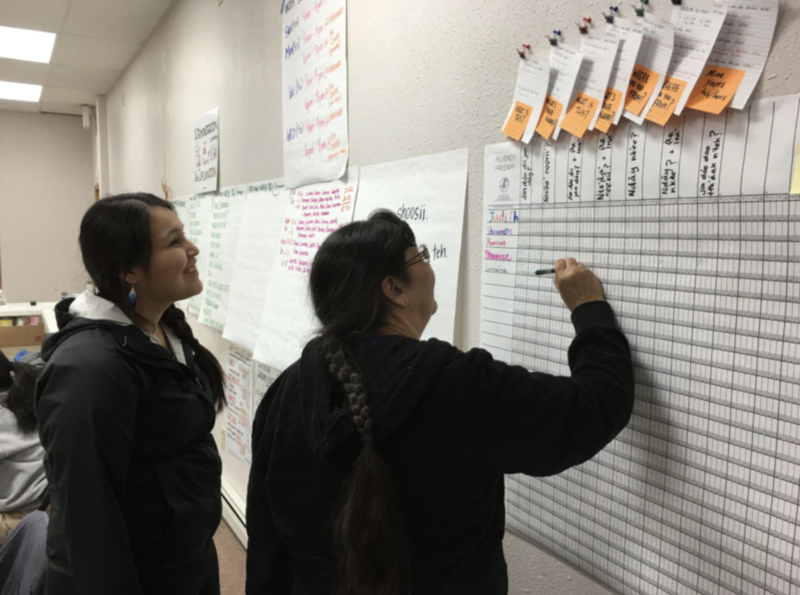 Several of our communities, including Tanacross, Tok, and Northway, may be familiar with the organization from the last time they visited several years ago and held language workshops. Those workshops were hosted through Doyon, University of Alaska Fairbanks Interior Campus, and local village councils. You can read about some of those events here and here. This workshop is the first hosted by AGSD. Where Are Your Keysis not a program to learn any one specific language, but rather is a method for revitalizing endangered languages and skills. Besides learning the method, all that is required is a fluent speaker of the language, and willing learners. Students at AGSD will learn methods for pulling language from fluent speakers as they also learn new ways to converse and interact with elders that will be learning experiences for both language and culture. Once students understand how to do this, they can also create lessons for teaching others. The idea is to teach students how to learn language on their own, and also how to teach it to others. Communities can use this as a way to sustain language and language learning by giving young people the tools they need to help themselves and help others. Evan Gardner and Susanna Ciotti of WAYK will be leading the workshops with the students. They led the previous WAYK workshops, and are familiar with our area, as well as many of our community members and elders who participated in those past workshops. Evan and Susanna will be arriving in Tok on Thursday, March 22. On Friday evening and Saturday, they are hoping to meet with community in Tok and Tanacross for an initial meet and greet to introduce themselves, to let interested community members know what will be happening, and to reconnect with participants from earlier workshops. The workshop will be held March 26th through April 6th daily at Tok School, with evening events on Wednesdays from 6pm to 8pm at Tanacross, and Thursdays from 6pm to 8pm at Tok. There will be a handful of students who will be present at the evening events as well as participating daily in the school workshop. Community members wishing to attend the workshops at the school, or wanting more information about the evening events or other info should contact Tracie Weisz, Director of Curriculum & Instruction for AGSD at 883-5151 ext. 113, or email her at tweisz@agsd.us.